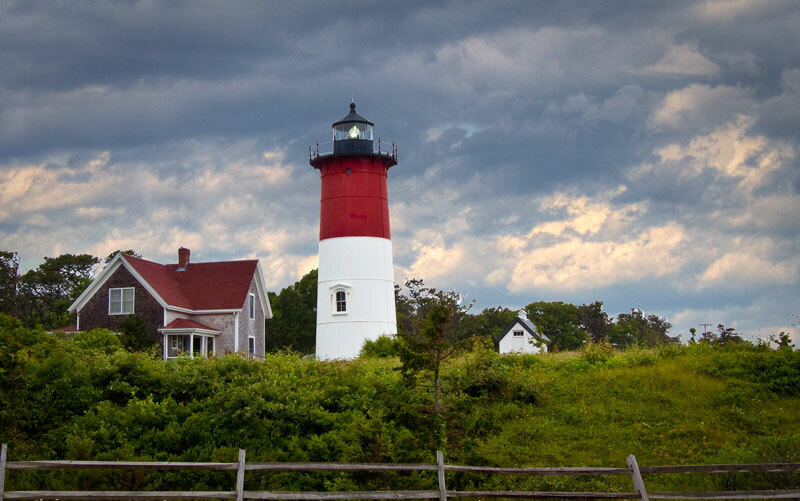 Two lights on the Cape began life as twins, but went their separate ways over the years. We saw them both, and didn't recognize they were twins until we learned their history. Mariners have long been wary of the strong currents and dangerous shoals around Chatham, where our friends live. Back in 1808, twin wooden towers were built to hold warning lights on a high bluff visible far to sea. Beaten by the weather, they were rebuilt using bricks in 1841. As erosion ate away at the bluff, twin cast iron light towers were built far back from the bluff face in 1879, and the brick towers fell into the sea just a couple years later. By the early 1900s, the Lighthouse Board began phasing out twin lights as an unnecessary expense, and one of the twins went dark. 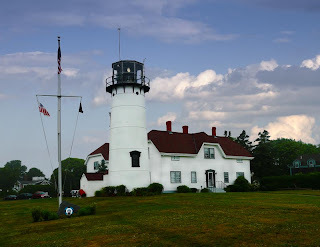 It wasn't long before the Nauset light up the road in Eastham needed to be replaced, and the thrifty Lighthouse Board decided to dismantle the unused Chatham twin and reconstruct it in Eastham, two hundred feet from the edge of a bluff. In its new life, its light blinked red then white, and it was painted to match its signal so that it could be distinguished by day. By 1996 storms had eroded its bluff so severely that the Nauset light was a mere 25 feet from the edge of the bluff. The Coast Guard would have let it fall into the sea, but a concerned group of local volunteers raised the money to have the lighthouse moved across a road to safety. The keeper's house was under private ownership, and was left standing a near the edge of the bluff. The owner of the house negotiated with the National Park Service for two years, as the cliff kept eroding away with each storm, and she finally made a deal to give the Service her house in return for being able to live there for another 25 years. They moved her house across the road near the light tower, and it would be nice to say that she was living there happily ever after. Unfortunately, she only lived three more years. Now the Park Service does tours of the house and grounds, and the light shines on as a private guide to navigation maintained by the local foundation. As for the Chatham light, it was automated in 1982 and remains an active guide to navigation maintained by the Coast Guard. The 1877 keeper's house beside it is used for Coast Guard housing.